I love it when I do my long run on the first day of the week. It kind of makes the rest of the week feel like a cakewalk. But how is it that 11 miles feels "long," again. It was only 2 weeks ago yesterday that I ran 26.2. Yeah, running does apparently warp one's brain. Today was kind of rough, though. My body mostly felt strong (at least compared to my long run last week), but my lungs were really not on-board. I waited until the rain and thunderstorm passed to get out there, but the humidity was VERY high. I could see the air and breathing felt like trying to inhale Jell-O. I hit the inhaler several times, but it made no difference. I do love that smell after a rain, though. It smells almost sweet. I dealt with some minor right knee issues, too. I thought I could get away without Superfeet in my newest pair of shoes, but apparently this is not the case. I mostly really like the shoes (Mizuno Wave Elixir 4, at right...recognize the color scheme? Navy, aqua and soft gray just look so appealing together...), but I wouldn't say that I LOVE them. Of course, I have never actually loved a shoe like I did my garish blue NB 902s...I'm wondering if a shoe will ever come along that works so well for me. 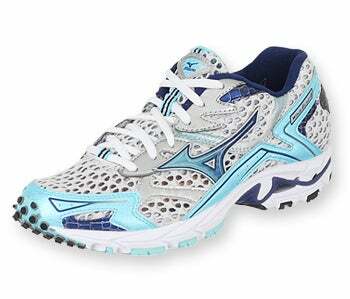 I tried to do a couple of runs with my Superfeet "berry" insoles (which solved my knee issues the first time around and have been a mainstay in all of my running shoes), but the Mizunos have a naturally high arch and it was just too much--felt like a golf ball under my foot. Superfeet makes a blue insole that has a lower arch and a slimmer, less cushioned forefoot, so they might help the Elixirs fit my foot better through the toes (they are just a hair too snug and curved). I returned from today's run with a bit of blistering on my right baby toe where it rubs the next toe. Things I do like about the shoe--fabulous heel fit. I have almost as difficult a time finding heels that fit my foot well as I do shoes that are wide enough through the toes. They are super lightweight, too. They are firmer than any of my NB 90_ series shoes were, but they still cushion well on a longer run...perhaps better, since I'm not compressing a firmer midsole as much with each step. I also like how breathable they are...that mesh is actually see-through. Those holes are really open. No hot feet on Summer runs. And those forefoot tread dots offer really nice traction on wet roads--very grippy. Assuming I can get the fit and medial support figured-out I'd probably buy another pair when these wear out. They have a nicely flexible forefoot, which is a must in a shoe (keeps the peroneal tendonitis beast at bay)...can't wear moderate stability shoes because of their stiff forefoot area, even though my knees need that level of stability. I'm a running freak of nature.